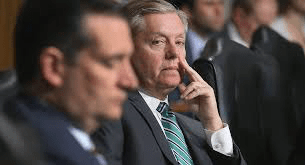 More on Trump and some Republican US Senator’s Middle East moves to help Israel …. Defense One is out with a backgrounder that points to efforts by Republican Senator’s to give support to the Israel Prime Minister that President Obama had issues with and deal with Syria…. The US Republican senator’s see there ability to get Trump to do things for Israeli Prime Minister in terns of anti-Iran (And Russia) and pro-Israel…..
Trump’s Middle East policy lately has been, in essence ,directed by several Republican US Senator’s…..
We’ll see if there is collateral damage in the region…. The timing of the announcement, ahead of Israeli elections on April 9, drew immediate accusations that it was aimed to benefit Prime Minister Benjamin Netanyahu, who faces a competitive campaign as well as a looming indictmentover alleged corruption. Following the move of the U.S. embassy to Jerusalem last May, it was the second time Trump reversed long-standing U.S. positions on Israel, appearing to offer a major gift to the Israeli prime minister without any obvious concessions in return. Yet the push for Trump to make such a move has been going on for more than a year, due to parallel efforts by Israeli officials and members of Congress. Texas Senator Ted Cruz was already drafting a plan to reinforce Israel’s control over the territory, which it effectively annexed in 1981, last summer. The rationale reported at the time had less to do with Israeli politics than with Iran, which was consolidating strength in Syria via its proxy Hezbollah and directly threatening Israel’s borders. At the same time, the issue was being discussed at the highest levels of the State Department and the National Security Council, according to Mark Dubowitz, who cowrote a February 2017 op-ed calling for the Golan recognition and was engaged in the discussions. The National Security Council would not comment on internal discussions, and the State Department did not immediately respond to a request for comment. In the meantime, the Cruz plan was rolling along, and was introduced as a Senate resolution cosponsored by the Republican Tom Cotton in December. That was only days before Trump announced, also via tweet, his intention to withdraw U.S. troops from Syria. Trump has since partially reversed that policy and the administration now says it intends to keep around 400 troops in Syria. And though U.S. troops’ stated mission there was the defeat of ISIS, Secretary of State Mike Pompeo has also said that the U.S.will stay until “every last Iranian boot” was out of Syria. The question of who would ensure this with the bulk of U.S. troops leaving, and how Iranian proxies could be kept from Israel’s borders, suddenly looked more urgent. In February Cruz, Cotton, and Representative Mike Gallagher introduced a bill to make it policy that the U.S. recognized the Golan Heights as part of Israel, though Israel’s annexation of that territory was never internationally recognized, and U.S. policy since the Reagan administration has not done so. All this maneuvering while Democratic House lawmaker Omar gets beatdowns for giving her views on American Middle Eastern policy and the Arabs and Israel….